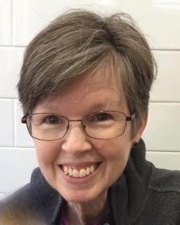 Gail serves as draper for all Department productions, co-supervises and teaches the lab portion of Costume Production class, and advises designers on the technical aspects of costuming. Before coming to KU, Gail was a staff draper at the Milwaukee Repertory Theater; working with such designers as Paul Tazewell, Laura Crow, Martha Hally, and Michael Olich. While a draper at U-W-Milwaukee’s Professional Theatre Training program, she worked with designers Rosemary Ingham and Bill Black, among many others. She also served as Shop Manager and Draper for Marquette University in Milwaukee. Other draping credits include the Milwaukee Ballet’s “Nutcracker” (designed by Zack Brown), PBS’s “Linda Eder in Concert”, “Barbie’s 40th Birthday” in New York City, and Barter Theatre in Virginia. Professional credits as a first hand and stitcher include American Players Theatre (Wisconsin), The Old Creamery Theatre Company (Iowa), Milwaukee Chamber Theatre, Marriott Lincolnshire Theatre (Illinois), and The Goodman Theatre.